Jimmy Kimmel Live!, featuring Jimmy Kimmel, alive. Things are a little hectic right now at ABC, what with all the corpses of old TV shows being hauled to the curb like dead Christmas tree to make way for the new. But if there’s one thing you can still rely on in a world where not even country music or The Muppets can stir the people’s hearts, it’s good old Jimmy Kimmel. 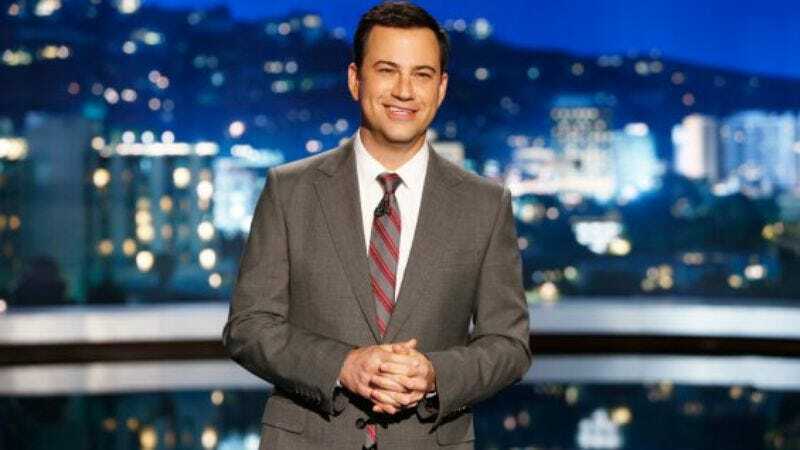 Currently the longest-reigning host in late night—12 years in, he’s been at the job longer than every other current network host combined—Kimmel has just agreed to continue his streak, signing a three-year contract extension that’ll keep Jimmy Kimmel Live! on the air until 2019. Live! currently sits in a contested second-place position in the late-night ratings, behind the rampaging frat-party juggernaut of Jimmy Fallon’s Tonight Show. Kimmel’s blue collar-friendly tone, connections with Disney’s Marvel movies, and deft hand at building established segments—like Mean Tweets, or the annual bit where he encourages parents to torture their children by telling them they ate all their Halloween candy—have frequently helped him fend off pushes from CBS rival Stephen Colbert, especially in the metrics of online views.